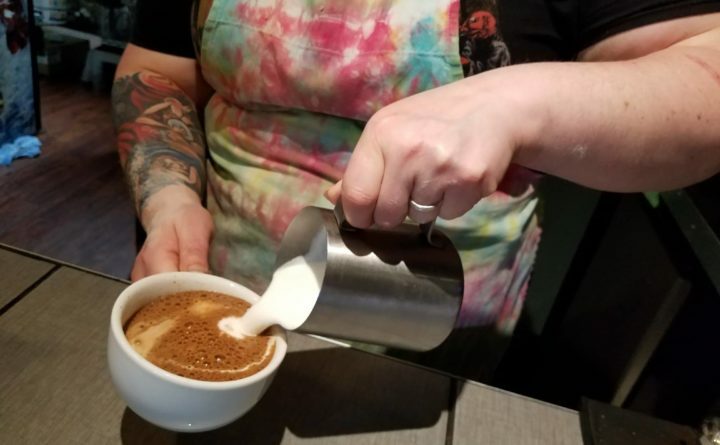 Chef-owner Carrie Shorette pours a cappuccino at Wicked Brew Care in Bangor. We already wrote once about cheap lunches in Bangor, but with a dining scene as dynamic and ever-changing as Bangor’s most of that old list is now totally out of date. We thought it was time for an update — so here’s a new list of affordable places to eat, for you and your friends and family to enjoy on your next lunch date. Frank’s Bake Shop, 199 State St.
About five blocks past Broadway on State Street is Frank’s, which longtime Bangor residents are probably already familiar with, but which newcomers might not know is a great spot to grab lunch. While it’s justifiably best known for its cakes, doughnuts, cookies and other baked goods, Frank’s also has a sandwich menu with items ranging from a $3.49 grilled cheese to a $7.95 turkey club wrap. 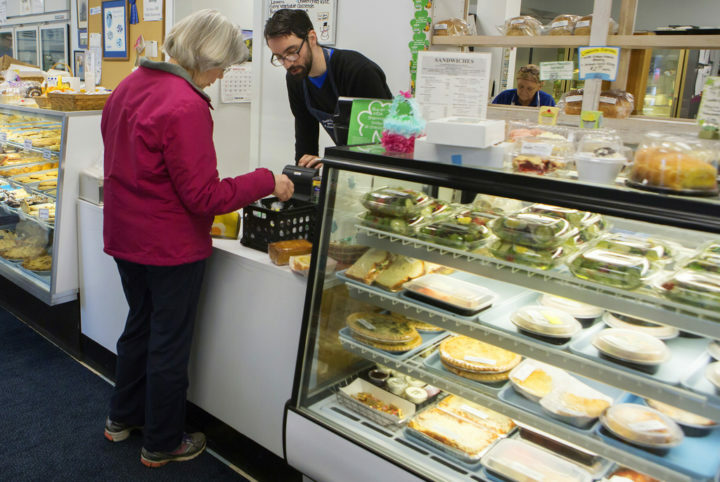 The majority of lunch items are in the $5-$7 range, and there’s also a cooler full of packaged quiche slices, salads, entrees and other goodies. Frank’s recently added pizza on Fridays and Saturdays, with slices priced between $3.50 and $4.50. There’s a reason Frank’s has been around for more than 70 years: quality food at affordable prices. Employee Eric Shepley (right) totals up the order of Gail Bach in March 2016 at Frank's bakery in Bangor. Legacy Sandwich Shop, 163 State St.
Now under new ownership — former owners Bruce and Carol Guimond sold the business to current owners, mother and son team Diane and Justin Bernosky, last month — the Legacy Sandwich offers classic subs and sandwiches, most notably the Legacy Sandwich, a version of a Coffee Pot sandwich, Bangor’s classic cold cut sub. Most sandwiches are priced between $4 and $6 for a small or $6 and $8 for a large. Jersey Subs & Sweets, 25 Hammond St. Similarly to the Legacy Sandwich, Jersey Subs offers sub sandwiches, though in this case, they are made in a New Jersey style, complete with oil and vinegar, shredded lettuce and soft bread. Half-size subs (which are quite filling) are between $6 and $7, and full-size subs (you’d better be hungry or ready to share) are between $8 and $9. There’s also Gifford’s Ice Cream, draft soda and penny candy to sate your sweet tooth. Bagel Central, 33 Central St.
Another Bangor dining institution for decades, Bagel Central is also arguably the most affordable and consistent lunch in downtown Bangor. Where else can you get a sandwich with a side salad for under $8? Or soup and a bagel for $5.20? Not to mention breakfast all day — a cheese omelet with a bagel with cream cheese is just $5.35. It’s really a steal. Not to mention the lively, convivial atmosphere in the dining area. 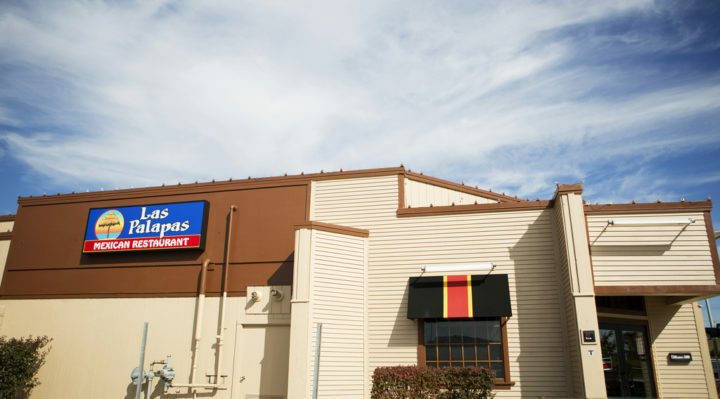 Las Palapas in Bangor is shown in 2014. This Mexican restaurant, with locations near the Bangor Mall, and also on Wilson Street in Brewer, is a popular spot to drink margaritas with dinner, yes, but people may not know that they have lunch specials that are a steal. In fact, almost everything on the lunch menu is priced between $6 and $8 — get either a chimichanga, burrito, quesadilla, or a couple of flautas or tacos, each served with rice and beans. We can’t recommend a lunchtime margarita, but they are extra, of course, should you choose to get one. Wicked Brew Cafe, 173 Park St.
Come for the coffee; stay for the food. This Park Street coffeehouse and cafe, now in its second year, offers a wide array of menu items beyond just baked goods and coffee. All of chef-owner Carrie Shorette’s sandwiches are $7.50 and under, all-day breakfast sandwiches are $5.50 and under, and there’s a rotating array of soups, casseroles, pasta dishes, quiches, frittatas, tacos and quinoa bowls — all creative, and all affordable.